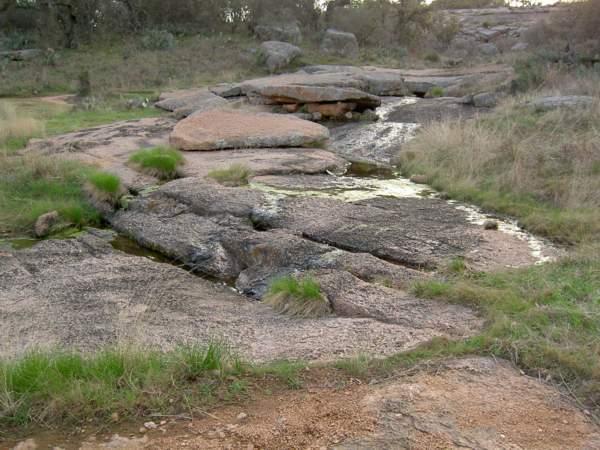 This is the view of the Enchated Rock area from the south. 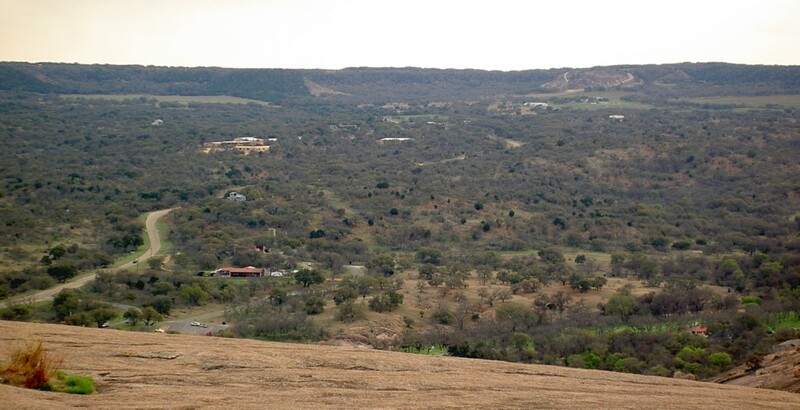 The road from Fredericksburg winds through the hilly countryside and then over a ridge from which Enchanted Rock first comes into view. 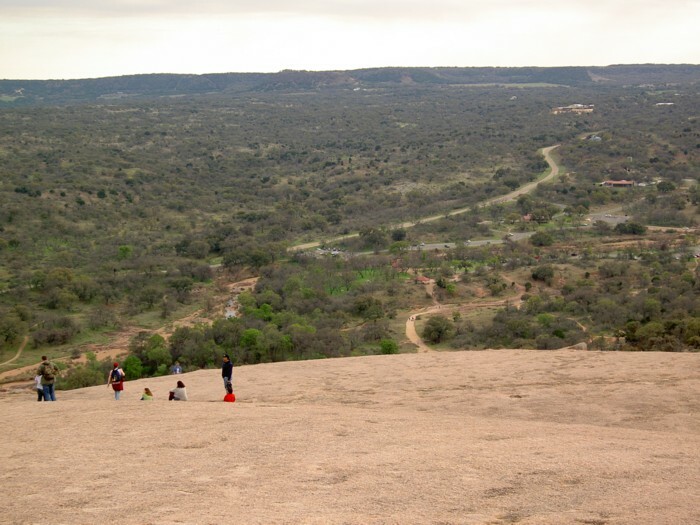 Enchanted Rock is the farthest dome. A dead tree is just visible all alone near the center of the top. This view is cropped from the previous image to show an enlarged view of the dome itself. The 'scar' looking feature about half way up on just right of center is a major landmark on this side of the dome. 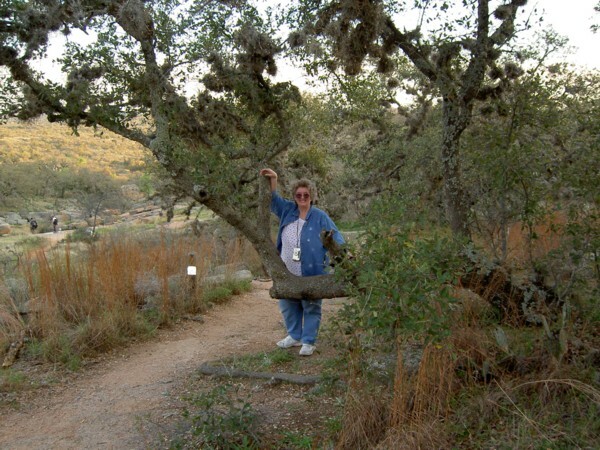 The tree is not much clearer in this view, but it obviously is a natural feature. There are some green trees over to the left of the summit. At last the summit! 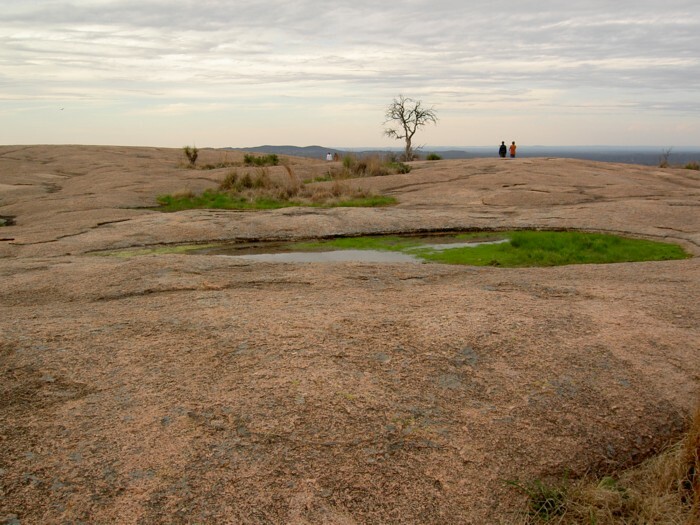 This is the dead tree that was just visible in the distant views of Enchanted Rock. The holes in the surface were full of water and green vegetation in places. Looking back to the south from the summit provides a view from the park headquarters to the road coming around the little hill along the ridge from which the first photo was taken. This view is cropped from the previous image to show an enlarged view of the road from which the first photo was taken. We had to drive past the curve and come back. Ann drove and I got out quickly so that she could move on. There was no parking place, but some of the scrubby trees had been cut down to provide a better view. I took the photo while she drove on to another turning area and quickly got back into the car on her return pass. Past the little grove of trees there is a lone tree obscuring the view of part of the road. I took the earlier photo from just beyond that tree. 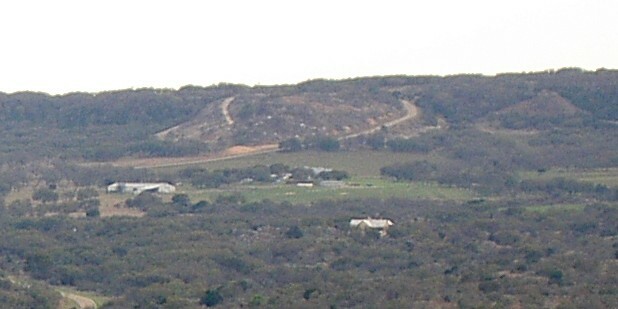 The road on the left of the little hill is a private dirt road, not part of the road to Fredericksburg. Ann had to rest along the way. I went on to the summit and took some photos and then went back to check on her. She was determined to make it all the way, so we started back up. She is visible just over the curve of the rock. She is in blue and white. The park headquarters building has a red tile roof and is at the right in this photo. A little gazebo at the trail head is also visible near the center of the view. It has a red roof also. 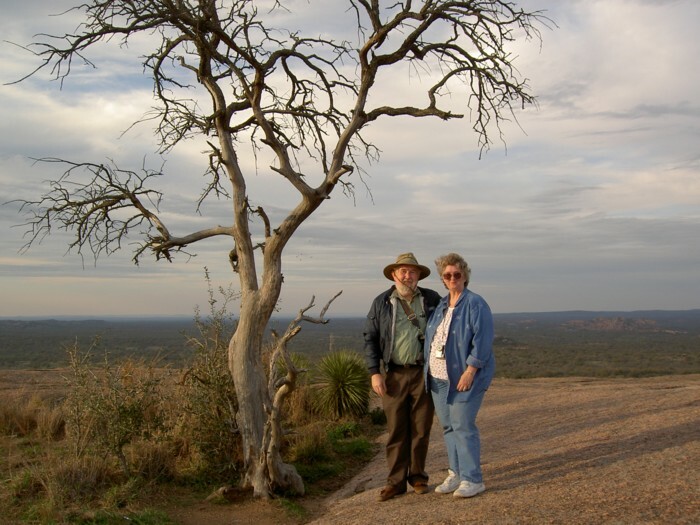 A young Chinese man took this photo of us by the old dead tree after I took one of him with his wife. Back at the bottom I photograph Ann with some of the natural features. The sun began to break through the clouds just before sunset and I looked back to catch this view of the 'scarred' area on the side of the dome. A buzzard, or vulture, is soaring above the dome in the right of this view. We saw several on the top, but they stayed far away from the tourists. The picturesque stream that crosses the trail.